Complex carbohydrates are an important source of energy for your body. They provide your body with the sustained fuel needed to exercise, perform activities of daily living, and even to rest. These carbohydrates may be found in foods such as grains, legumes, nuts, and seeds. Complex carbohydrates may also provide vitamins and minerals. There are two main types of carbohydrates: simple carbohydrates and complex carbohydrates.The difference between the two is simply the size of the molecules. Simple carbohydrates are made up of only one (monosaccharide) or two (disaccharide) sugar units. Simple sugars include fructose, sucrose, glucose, maltose, and lactose. These may be found in table sugar, candy, honey, and syrups. Simple sugars provide quick energy. Complex carbohydrates contain at least three sugars. Oligosaccharides contain between three and ten simple sugar units. Polysaccharides can contain hundreds of saccharides. Complex carbohydrates provide with relatively sustained energy. Dietary fiber is the fiber that is naturally found in plant cells. Cellulose forms the structures that give plants their shape and it's the main component of dietary fiber. Vegetables such as green beans, broccoli, and spinach contain less starch, but they have more cellulose or fiber. Your digestive system can't break cellulose apart. That means that having non-digestible fiber in your digestive tract slows things down. Gastric emptying (the speed at which food leaves your stomach) slows down as does the absorption of sugar into your bloodstream. Starch is used by plants to store energy. Starches are found naturally in some foods such as garbanzo beans lentils, barley, corn, oats, and wheat. Some vegetables also contain starch such as carrots and potatoes. Starches can also be added to foods during processing or in preparation to thicken or stabilize them. Starches are digested and absorbed by the human body relatively quickly—although not as quickly as simple sugars. As a result, starchy foods like white bread and pasta can result in a blood sugar spike, sometimes like eating something that's high in sugar. People who are sensitive to sugar often avoid starchy foods most starchy foods are rapidly broken down into sugar. It turns out that not all starches are created equal. Some starches are digested very quickly and cause a more rapid rise in blood sugar. Others are digested more slowly, causing blood glucose to rise less and over a longer period of time. Some starch, called resistant starch, is not digested in the small intestine at all and causes little or no blood sugar rise. The larger the percentage of rapidly digested starch in a starchy food, the higher the glycemic index of that food. So what determines whether starches are digested rapidly or slowly? There are several factors that play a role in the speed of digestion. Different kinds of starch have different arrangements of molecules, and some are easier for our digestive enzymes to get at than others. One kind of starch, called amylose, is broken down quite slowly. The higher the amount of amylose in a starch, the more slowly it is digested. For example, different types of rice have differing percentages of amylose. Grains of long grain rice tends to stay separate and are higher in amylose. Shorter grain rice grains tends to produce a creamier and stickier dish. It is low in amylose and more glycemic. 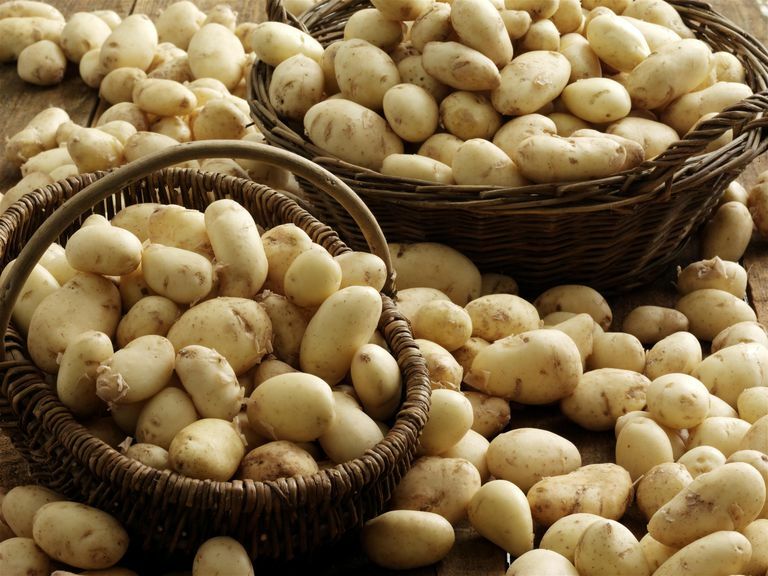 New potatoes (sometimes described as "waxy") have a starch that is closer to amylose in structure than more mature potatoes. They are somewhat less glycemic. Most of the starch in beans has a structure which is only slowly broken down into sugars. The grains we consume tend to be heavily processed. Particularly when it comes to wheat, we have a tendency to grind it, puff it, flake it, or roll it into any number of processed foods. When we process whole grains, we limit the work that has to be done by the digestive systems. Therefore, it's no wonder that these foods are turned into sugar quickly and efficiently within minutes of being consumed. The starches that are most rapidly digested are those made from flour (including whole grain flour) and most breakfast cereals. On the other hand, if grains or legumes remain whole, such as beans, brown rice or whole barley, the starch is broken down into sugars much more slowly. In fact, some are turned into sugar at all but reach the large intestine intact—these are called resistant starches. Pasta is a food that is often considered to be high in starch. But there are other factors to consider. Apparently, starch molecules in pasta are so tightly packed that only about half is rapidly digested when the pasta is cooked "al dente" or slightly firm. Cooking time and the thickness of the pasta greatly affects how the glycemic it is. Additionally, when some cooked starches, such as potatoes and rice, are cooked and cooled, a small percentage of the starch takes longer to digest. Measuring the exact impact of a complex carb (or any food) on your body can be tricky. It is difficult to know how quickly any one person will digest any individual food or where each part of the process occurs. Additionally, each person's digestive system is a little different, and factors such as how thoroughly the food is chewed and what other foods are eaten with it also have an effect. There are various means of testing that are not standardized. The only real way for a person to know how glycemic a food is to them is to monitor their blood glucose. Factors including structure, processing methods, and the way you cook your food can affect how quickly a starchy food is digested. Individual eating variations (including how much you chew your food) can also have an impact. When choosing starchy foods, there are a few guidelines to keep in mind. The best starchy foods are whole beans or lentils. The starch in these foods is either slowly digested starch or resistant starch. However, due to processing methods, canned beans are more quickly and fully digested than ones cooked from the dried state. When choosing grains, chose those that are whole and intact when cooked, such as brown rice, barley, amaranth, or quinoa. Avoid most baked goods or anything made with flour. Best choices are specially-made low carb bread, which have less starch and more fiber. Avoid processed cereals with little fiber. Best choices are cold cereals which are mostly fiber, or hot cereals made with whole grains. Lastly, consider foods that provide other nutritional benefits. For example, fruits and vegetables provide carbohydrate along with important vitamins. And you'll get a range of minerals in many grains. Important Nutrients to Know: Proteins, Carbohydrates, and Fats. National Institutes of Health. National Institute on Aging. June 11, 2017. Simple vs Complex Carbs. Diabetes.co.uk. Total Carbohydrate. Nutrition Facts Label. U.S. Food and Drug Administration. Fact Sheet. Should You Eat Foods Rich in Resistant Starch? Can You Eat Radishes on a Low-Carb Diet? What Is the Sugar Busters Diet?